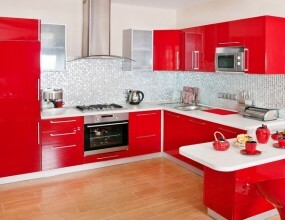 Lunarfurniture.com – Cabinet is a kind of furniture which is very important to be placed inside the house. The main function of a cabinet is for a place where we can keep so many things. Well, the placement of the cabinet is mostly found in the kitchen area, where the cabinet can be used as the storage of the kitchen appliances and some cooking materials which are needed to be placed safely. Because of the existence of the cabinet, the kitchen area’s appearance is getting better and nice to be seen, since there are not so many kitchen appliances placed anywhere untidily. Because of the important function, many new wedding family will buy this cabinet so that the needs of kitchen appliances storage soon after their wedding. As time passes, the wedding grows older, the cabinet will fading especially in the color appearance. There is any possibility that the cabinet still can be used as the appliances storages and in a good condition, but, the color fading can damage the interior appearance inside the house. For this reason, we need to repaint the surface of the cabinet so that it can be nice to be seen anymore. In the color painting process, the first thing that we need to do is to choose the paint we like to use in the kitchen area. There are several things we must consider; move any things which we won’t paint so that they won’t be splashed by the paint. We also can cover several places or items with old newspaper in order to avoid the paint splash. Before repainting the cabinet, we must sanding the cabinet’s surface with sandpaper so that the old paint removed and the surface is smooth and easy to be repainted.